Whispers in the Loggia: "Prophet, Witness, Servant"
At Tuesday's ordination of one of his two new auxiliaries for Canada's largest local church, Archbishop Thomas Collins of Toronto preached a challenging catechesis on the bishop and his ministry, especially in moments of crisis, that won raves from many on-hand to hear it. A Scripture scholar, longtime formator and sometime retreat-master for Stateside clerics now approaching his third anniversary at the 1.7 million-member TO church's helm, Collins turns 63 at the weekend. Last week, Pope Benedict named the media-friendly cleric to the membership of the Pontifical Council for Social Communications. The archbishop's fulltext is below.... Considering the frequent temptation to focus more on the office's prestige than its responsibilities, it's an especially useful read. 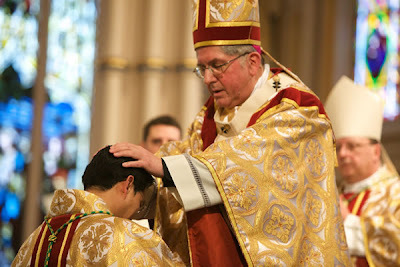 The shot above comes from yesterday's ordination (audio/photos) of Nguyen, Canada's first-ever Asian prelate, whose moving story of faith, family, fortitude and firsts has garnered national coverage. "We Are Called... To Be a Light"
In Fort Wayne, the Nuncio's "New Deal"
"We Can't Quit Praying, We Can't Quit Responding"
For Haiti, "Your Help is Urgently Needed"